Jazz legend and New Orleans native, Louis Armstrong, died in his sleep, on July 6, 1971 in the Corona, NY home in which he had lived since 1943. The next day, a visitation was held in a local funeral home. Meant to be private, the name of the funeral home was withheld from the press, but neighbors easily figured it out and soon gathered outside. A day later, a public visitation took place from 10 A.M. until 10 P.M. at the Seventh Regiment Armory at Park and 66th Street in Manhattan. It was estimated that 25, 000 people filed past Armstrong’s open casket to pay their final respects. Dressed in a navy blue suit, pink shirt and pink and silver tie, Armstrong reposed in a steel grey casket with white velvet interior, under the grand, wooden staircase in the armory’s front hall, which was filled with floral tributes. Armstrong’s religious service took place at the Corona Congressional Church in Corona, the next afternoon. Among the five-hundred mourners who packed into the small brick church, four blocks from Armstrong’s home, were notables from the world of music -- Ella Fitzgerald, Peggy Lee, Dizzy Gillespie –- and politics –-Governor Nelson Rockefeller, Mayor John Lindsay and New Orleans Mayor Moon Landrieu. During the lengthy service, mourners fanned themselves with paper fans on the hot summer day, as tributes were paid through song and numerous eulogies. “Move over, Gabriel, here comes Satchmo,” said Fred Robbins, a close friend who delivered the main eulogy. Later, as the funeral cortege made their way to Flushing Cemetery along Northern Blvd. (a main thoroughfare) groups assembled along the route-- some holding placards which read “We loved you Louis” -- waiting to get a glimpse of the procession. That evening, the funeral service was televised along with highlights of Armstrong’s career. 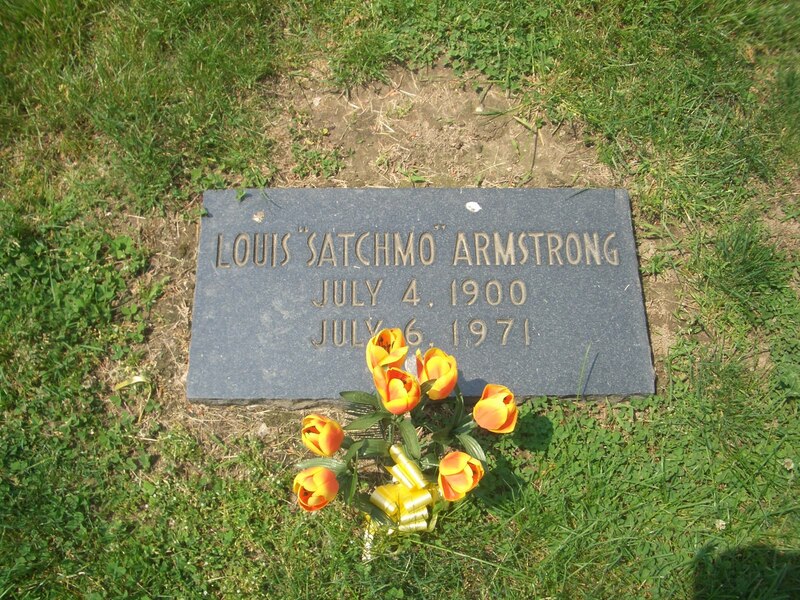 Two years after Armstrong’s death, a service was held at Flushing Cemetery to dedicate Armstrong’s monument: a gleaming black granite stone -–his name emblazoned in gold letters-- with a bronze reproduction of his trumpet on top. His footstone bears July 4, 1900 as his date of birth. 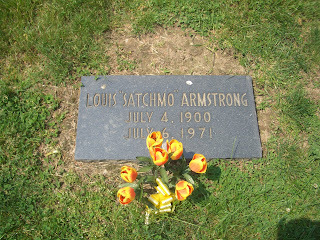 Throughout his life Armstrong could not be sure of his birthday, choosing to celebrate on Independence Day. It was only after his death, that his true birth date -–August 4, 1901-- was discovered. Armstrong’s Corona home is now a museum, where two of his five trumpets can be seen. The remaining three are housed in Queens College, as part of the Louis Armstrong Archives. His beloved widow, Lucille, who died in 1983, is buried with him.